My love for cheese surpasses my love for many things (cats, pizza, wine, and family not included) and the thought of living without it grates my soul- fondue in particular. These pots of bubbling cheese evoke memories. Of fondue parties at my creaking Victorian 100 year old Tacoma apartment with my mom, Brooke Casanova, and Lisa looking out over the heavy foliage at Wright Park. Fondue nights at The Miller’s over an episode of American Horror Story or Mad Men. A cozy night in my fur slippers with Basil and Lile at the edge of the table, hoping for a stray drop of liquid gold to fall from the tiny pronged fork. Fondue, derived from the French verb fondre, meaning “to melt” basically sums up my relationship with the dish. As a non-chocolate lover, I stick to the cheese variety (sometimes dipping a toe into the hot oil variety)- and with so many variations; I’m never left in want of something new! Gouda with caraway and kirsch? Gruyére and a citrusy white wine with Truffle oil? Sharp Irish cheddar blended with a peaty whisky? Swiss paired with a rich, dark beer? Fontina and chili pepper, married into perfection? 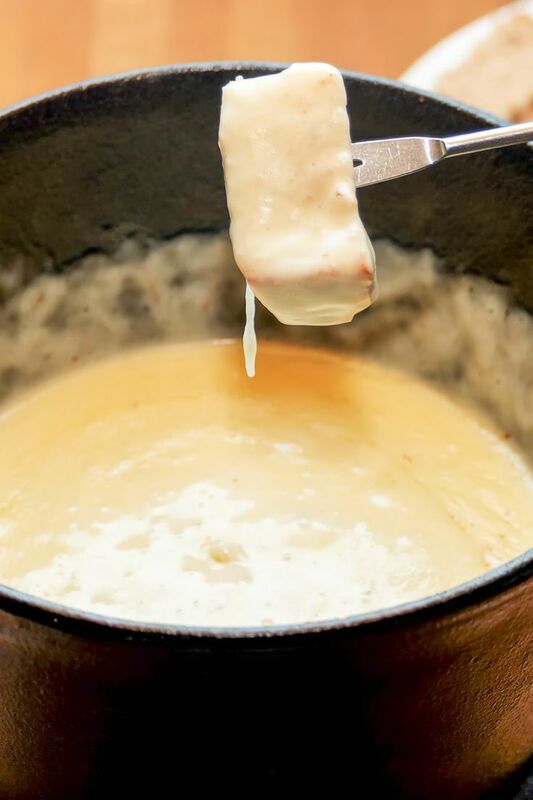 The delights of fondue don’t end just at the taste- one Swiss tradition is that if a man drops a piece of bread into the fondue cheese he must buy a round of drinks for everyone and if a woman drops a piece of bread into the fondue cheese- she must kiss all of the men. Quite the friendly barter! Since I left all three of my fondue pots back in the states- making my all-time-favorite has been slightly more difficult. But Cambodian-dwellers or those who don’t own fondue pots- don’t cry! Because it’s actually quite simple to get down with this dish even without a glorious fondue pot. Here’s my go to recipe. It makes…enough. 1. Put a pot of water half full on the stove and a larger pan on top of that. The water will boil in the pot and heat the top pan which will melt the fondue. Let me be very clear that it helps that the top pan is NON-STICK. Turn temperature to medium-high. 3. Cut the cheeses into small chunks as it will melt smoothly. Grating works as well, but won’t melt as well. 3. Peel garlic clove and cut it in half. Rub the top non stick pan with each side of the garlic cloves. 4. Pour wine into pan and bring to a gentle simmer as the bottom pot heats up. 5. Once the wine is simmering, add cheese by the handful and stir until melted before adding the next handful. Add cream if needed along with cornstarch and continue to stir until smooth. 6. Season with salt and pepper (or chili powder if you want a kick!). Pointer: if the consistency of the cheese is becoming too thick, add a dash of warm wine to break it up. Serve with lots of bread, apples, and vegetables like cauliflower and broccoli. ← “Black Magic” & Photo Roll 13.